Wes Anderson’s long flirtation with whimsy has finally resulted in their tying the knot in The Grand Budapest Hotel. I’m afraid that the union cannot be a very happy one, at least not for film-goers, though it does provide a certain amount of fun. In Bottle Rocket (1996), Rushmore (1998) and, to a lesser extent, The Royal Tenenbaums, of 2001, Mr Anderson still had one foot planted in reality, but since then he has been steadily losing this toehold, presumably on account of being told too often how delightfully whimsical are such subsequent productions as The Life Aquatic with Steve Zissou (2004), The Darjeeling Limited (2007), The Fantastic Mr Fox (2009) and Moonrise Kingdom (2012). 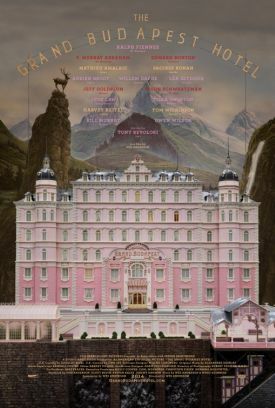 The last-named at least had something semi-serious to say about the kind of childish innocence which must have produced its whimsy in the first place, and if Grand Budapest Hotel has a similar saving grace, it is the performance of Ralph Fiennes in the role of Gustav H., said to be the Hotel’s legendary concierge in the 1930s. Mr Fiennes’s hitherto unsuspected talent for comedy makes the scenes he is in, which are most of those in the movie, a constant delight, in spite of periodic reminders that the dialogue is not natural to him. You may frequently hear, for example, the characteristic British pronunciation of the distinctively American "swear" word "goddamn" with a single medial "d" instead of the authentic double-d of us red-blooded Americans. It’s a dead giveaway, not only to his own origins but to those of the movie itself. As his character is supposed to be neither British nor American but someone of indeterminate nationality living in the fictional country of Zubrowka, said improbably to have been once the seat of a great empire, in an even more fictional version of Mitteleuropa between the wars, the jarring effect of his mispronunciation is to break the spell of Zubrowka, such as it is, and to return us with a bump to the Anderson fantasy-factory somewhere spiritually if not physically near Austin, Texas. Monsieur Gustave’s story is told as a flashback within a flashback within a flashback as we jump, first, from the present to 1985 and a videotaped recitation to camera by Tom Wilkinson, who is supposed to be the great novelist who wrote it down, as he is being interrupted by a mischievous grandson. The author claims that the story, like most stories, came to him unbidden and he purports to describe how it did when, as a younger man (played by Jude Law) visiting the eponymous but by then decidedly down-at-heels hotel in 1968, he first heard it from the then aged Mr. Moustafa (F. Murray Abraham), the hotel’s owner. As Zubrowka is at this time supposed to be part of the Soviet bloc, it’s not clear how it comes to have a private owner. But Mr Moustafa, who started his career as a lowly lobby boy named Zero (Tony Revolori) under M. Gustave’s expert tutelage and who still worships the great man’s memory, then becomes the narrator as he and the author dine in the hotel restaurant. It’s an enjoyably convoluted lead-in to the main part of the movie, filmed in the boxy 1.33:1 aspect ratio of of the movies of the period, and featuring authentic-looking, overdecorated interiors, formal speech patterns spiced with the occasional incongruous-sounding obscenity and a madcap plot less interesting for its own sake than as an homage to old-time Hollywood. The fantastical and frankly unbelievable story has to do with M. Gustave’s being left a valuable painting by an elderly hotel guest (Tilda Swinton) who is also one of his many paramours and with her aristocratic family’s efforts, set amidst the threat of war and revolution mostly just off-camera, to get the painting back at whatever cost to M. Gustave and his faithful companion Zero. These efforts are led by the evil Dmitri (Adrian Brody) and his even more evil henchman Jopling (Willem Dafoe) and involve elaborate chase sequences and a jail-break after M. Gustave is incarcerated alongside the scary-looking Ludwig (Harvey Keitel) of whom he nevertheless manages to make a friend, as he does of most of the people in his life. It’s only what you would expect from such a superbly serviceable concierge. By now, as Mr Anderson must be aware, audiences are more familiar with pastiches like this one than they are with the 1930s-era pictures they are pastiches of. There can therefore be no question of taking seriously the story itself, though the intricate if pointless mechanism by which it is brought to the screen and the loving care with which something like the milieu of the pre-Nazi European entre deux guerres is recreated are themselves meant to be enough to stand for those "faint glimmers of civilization that are left in this slaughterhouse that we call humanity" — glimmers for which M. Gustave, in one or two of his many expansive moments, claims to live. It’s all just a bit glib, as whimsy generally is when it’s not something worse, and partakes of the lofty disdain for political, diplomatic and military realities of Stefan Zweig, by whose stories and autobiography (The World of Yesterday) Mr Anderson claims to have been inspired. Still, it’s quite a lot of fun to watch, mostly because of Mr Fiennes.